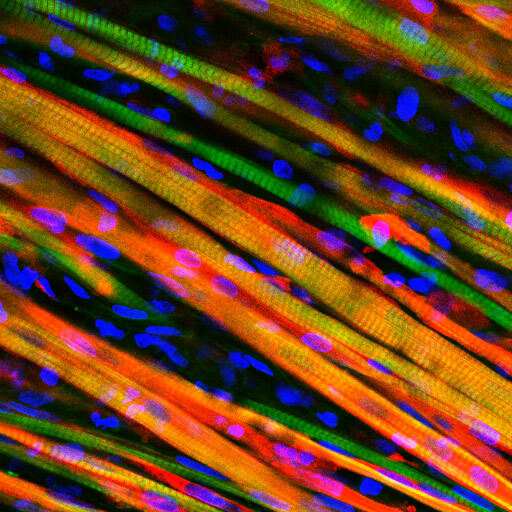 Long, colorful strands of engineered muscle fiber have been stained to observe growth after implantation into a mouse. Biomedical engineers from Duke University have grown living skeletal muscle that demonstrates the ability to heal itself both inside the laboratory and inside an animal. Here,cells travel through veins that have grown into laboratory-made muscle fibers after implantation into the back of a mouse. This series of images shows the destruction and subsequent recovery of engineered muscle fibers that had been exposed to a toxin found in snake venom. This marks the first time engineered muscle has been shown to repair itself after implantation into a living animal. This series of images shows the progress of veins slowly growing into implanted engineered muscle fibers. This work was supported by a National Science Foundation Graduate Research Fellowship and the National Institute of Arthritis and Musculoskeletal and Skin Diseases (AR055226). Be the first to comment on "Biomedical Engineers Grow Self-Healing Muscle"